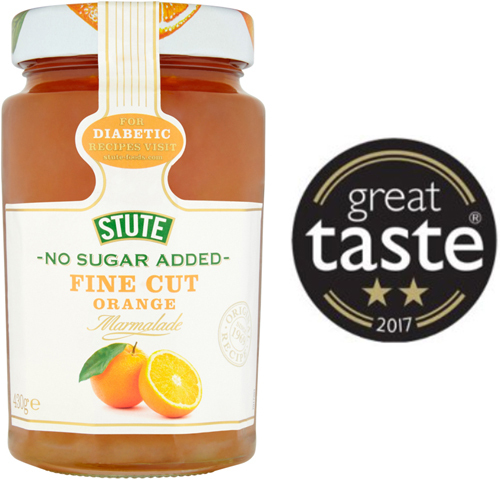 Out of over 12,300 products to be judged, Stute Foods of Bristol was awarded a 2-star Great Taste award, which means judges dubbed it outstanding for its No Sugar Added Fine Cut Marmalade. “Having never entered the awards previously Stute Foods wanted to put its No Sugar Added Fine Cut Marmalade to the test against all major competitors in the market. It is a great achievement that we have been scored so highly for taste even though the product contains 90% less sugar than ordinary marmalades on the market”, explains Laurence Hybs, Stute Foods Managing Director. “We are over the moon to have been awarded a 2-star Great Taste Award for this product and hope this will add value to our brand both in the UK and Internationally. “Appearance is rich and golden orange. The peel is cut and cooked really well with a good amount of pith. The flavour is excellent - natural sweetness with a good bitterness from the pith. Left with a pleasant bitter, fruity tingle”. Stute’s No Sugar Added Fine Cut Marmalade can be found in all major UK supermarkets and in over 45 countries around the world.